The headquarters of the presidential candidate of Ukraine, showman Volodymyr Zelensky has reported that information in the media about possible personnel decisions after winning the presidential election is based on speculation and assumptions, and now there is a process of selecting candidates for appointment to the government positions. "There was information in the media about the appointments that Volodymyr Zelensky allegedly plans after winning the presidential election in Ukraine. We would like to draw your attention to the fact that these messages are based on speculation and assumptions. They did not make any personnel decisions in the team of Volodymyr Zelensky. 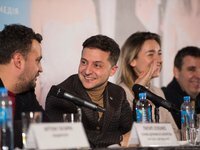 Moreover, they will not be made backstage, since it was not for nothing that we asked the Ukrainians who they would like to see on key positions," the press service of Volodymyr Zelensky said on Wednesday. The message says that now there is a process of analysis and selection of candidates for appointment to government posts that are within the competence of the president of Ukraine. "Candidates will be announced before the vote in the second round, as Volodymyr promised," the message said.